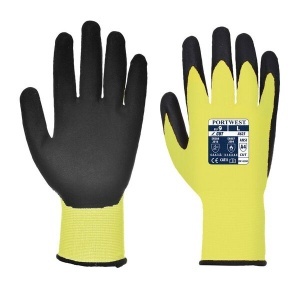 Because of their super tough glass HPPE liner that offers exceptional protection from cuts and their high heat resistance level, the Portwest Hi-Vis Cut-Resistant Yellow and Black Gloves A625Y8 are ideal for use across a wide variety of industries. High dexterity, comfort and grip mean that the Portwest A625Y8 gloves guarantee exceptional, long-lasting high performance. 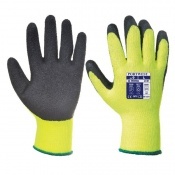 The Portwest Hi-Vis Cut-Resistant Gloves are highly suitable across any industry that demands mechanical protection, as their tough HPPE liner ensures exceptional strength. 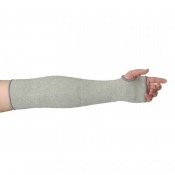 Furthermore, comfort, dexterity and heat resistance, mean that the gloves won't go amiss in industries that range from building and construction to engineering and mechanics. 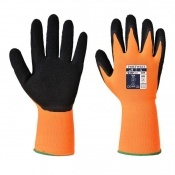 The Portwest A625Y8 Gloves are available in four sizes that should be suitable for most users. To find your perfect pair, please measure the circumference and length of your palm and match the results to the table below.